Llwyn Derw is a Grade 2 listed Arts and Craft period house which is well preserved with good interior features, tastefully refurbished with modern facilities.The features include an impressive hall and an unusual fireplace with panelled back and copper art nouveau details in the breakfast room. The breakfast can be a full Welsh cooked breakfast using local produce , continental or vegetarian. There are two en suite rooms. 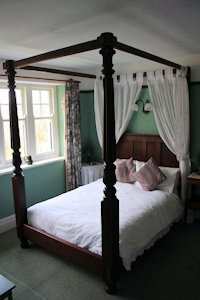 The blue room is a double furnished in pine.The Green room has a mahogany four poster and a single bed so can be used as a double , a twin or family room. A tray is available with tea and coffee, a flat screen TV and hair dryer.Iron and board available on request. There is ample parking facilities by the house or garage or on the lane by the house. A warm welcome awaits you from the proprietors John and Carys Meurig Parry , She is an artist and a gallery of paintings is on display.